In this in-depth interview with property tax & accountancy expert, Simon Misiewicz of Optimise Accountants, dives into Rent to Rent property tax. 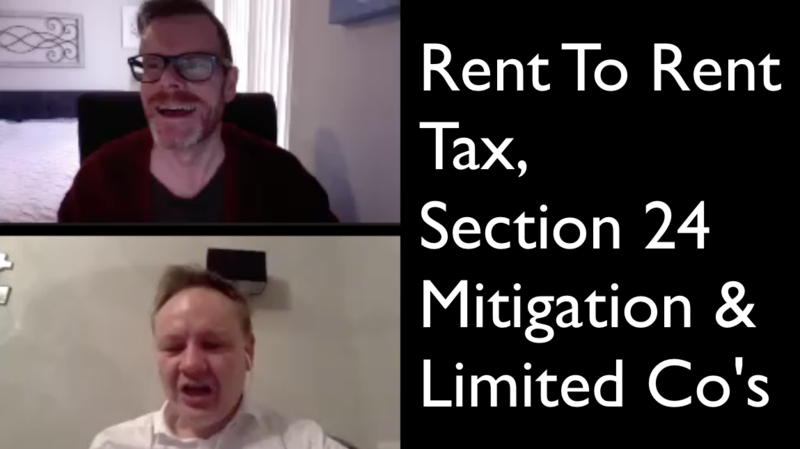 We talk about property tax as it relates to the popular rent to rent strategy, tax allowances, Section 24 changes to tax relief, ways to mitigate Section 24, and limited property companies. John Wilson: Welcome, this is John Wilson of Property Investment Blueprint.com and today I'm excited to be speaking with property accountancy and tax expert Simon. Sorry Simon, I meant to ask you before we started how to pronounce your name. Simon Misiewicz: A lot of people to be honest call me Simon M; for everyone listening in it's Misiewicz but if you haven't had a couple of glasses of wine or beer then Simon M is perfectly fine with me. Simon Misiewicz: Simon M it is then. So Simon Welcome to the podcast today. Simon Misiewicz: Thank you. It's great to be here John and really looking forward to hopefully delivering excellent session for you today. John Wilson: Well I know you've got a bit of a presentation for us that we're going to follow but well, if you want to start off with just tell us a bit about your story like which came first for you to accountancy or property investing and I'm what inspired you to specialize in property. Simon Misiewicz: I'm just gonna get rid of the slides of others. Okay, for anyone that's kind of wanted to know more about what we talked about today. We do have a series of articles that you can see on our website which is www.optimiseaccountants.co.uk and visit those articles whenever you want to. As we go through this they'll be a Q&A John and I will break up from each of our slide points and will hopefully John's got some Q&A, which is from you guys. Anyway, so I'll be happy to answer those. But as john said you know what is my background what came first the chicken or the egg? So I was an employee, a long time ago: business consultant and I worked for many blue chip companies like Boots, Imperial Tobacco, Virgin Media mainly as consultancy IT, management and infrastructures and putting in finance departments across the globe and it meant that I was traveling from one country to another on a frequent basis and I didn't really want to be that employee for long. So I started to invest in properties. So then I had one or two single let properties like this one, generating a huge whopping 6% return on investment and most people would laugh at that. 6% is laughable but at the time, that was quite impressive for me as an employee. And I think that came first. Really, I wasn't in property tax to begin with. I had an accountant, who's a good friend of mine who did a lot of work for me, that's certainly an interesting conversation because it's you know it's it's two friends but it is involving money and I'm scrutinizing stuff and he said, look, why don't just do it yourself, you know a lot more about it than I do. So like, lo and behold, I started doing and I did some education courses myself I've ran education courses as well. I've been an author, all the way through this journey and I was picking up clients here, there and everywhere. And when I was talking to people at networking events and soon enough, I had 100 clients in my business I gave up the consultancy work went into the accounting business as a property tax specialist and carried on investing in my own properties and and because of education. I think anyone listening in. I'm not an educator in property investing. I'm an educator really in tax and giving people wealth and tax planning advice ready I'm not a person that you can turn to and say, well, tell me how to invest in property, then rent to rent and I just wouldn't be your best person for that because it's just not my area of expertise. I did myself but and so this slide will show you what we now do is that we invest in properties that we can convert so we'll take a big old house and that in five bed house as we take all the walls out and start a fresh, so we will basically create miniature flats inside of the property and it for me is better than HMO because it's very time consuming and just keeping tenants happy, tenant check-ins so for me that was too noisy because of Optimize Accountancy growing throughout 2015, 2016 and I'm up and down the country networking. So these pods I call them now these little flats if you like in these ones are a lot better for me because they're quieter, they're almost like single lets but the miniature but they will do for people wanting to get out of their parents home or people are split up or what what we're what we do find interesting is that we're we're servicing people that have got second they've got a home in London, that they want to. They've got a contract in Nottingham maybe as a doctor or a solicitor or a business consultant or you name it builder even. We do stay with the white collar workers to keep that niche going. And I would you tend to find that that type of market place. And we've been doing really, really well with that so 15-25% return on investment for doing that. Very well. I'm just to re-echo the point I made earlier about, you know, whatever John is telling you about education and improving your strategies. Make sure you you do listen because I think it's about enhancing your knowledge take taking that step further and developing and I guess that gives me a bit of a summary of where I've come from to date. John Wilson: Yeah, I like I like that idea of that the pods Simon, it's it's not really something I mean I guess it's it's it's a bit like the old concept of the the bedsit right? But something much higher class. Right. Simon Misiewicz: Yeah. So we interesting enough we had, we will charge for one single flat in Nottingham around about 650 pounds rent per month. And that includes bills so that’s not a net rent, but these pods we have one boiler system, we have one fuse box we have one water system so we don't have multiple charges for gas, electricity flat rates. We just have one. So the bills are really, really small, the property value itself values are not that great, the mortgage values are not that great. So really, we're getting good rental income on all of these properties, if I'm honest. John Wilson: So you being the tax guy, are there particular particular tax advantages of this way of doing things? Simon Misiewicz: Yeah, absolutely. That's good point actually. The reason why we moved into this kind of thing. If you take one dwelling like a single house. Then you carve it up into HMO or a bedsit; multiple dwellings like we have here, then the refurbishment cost is reduced from 20% to 5%. So that was a huge amount of saving that we are making on the refurbishment 15% and anything in any capacity is great, but we were spending over about 125,000 pounds on these refurbishments, in the on the picture that you're seeing now and I think we saved about 10 to 15,000 pounds on VAT alone. John Wilson: Wow. That's fantastic. Great. Simon Misiewicz: So shall we move on. Simon Misiewicz: Okay, So what I thought we do that is. What I believe people when doing the rent to rent strategy what matters is having the basics in place. It's not just about one strategy. It’s about looking at your finances as well as your tax planning at the same time. And the one thing I would is say basic administration -- and to be fair this can apply to any property strategy that you follow but again it’s all about the rent to rent for what I’m about to deliver here. You should keep a separate bank account for your property business. What I mean by that is making sure that all your rental income and the cash you receive from your tenants is put into one property bank account and the expenditure, so the expenditure for your refurbishment, your gas, your electricity. I guess John from your side of things, most people that are doing rent to rent, are they doing HMO rent to rents? John Wilson: Yes I would think so yeah those, those are the main ones that I hear about. Simon Misiewicz: So that that's really important because the big thing I would say is you're paying for all the utilities, whether you're using BT or Virgin or any other type of telephony and broadband, you will have all that expense going out and I think it's really important to make sure you have that in one bank account. The big thing for me and for that is because you want to know if our bank balance is going up, then you do know that that is a successful business so far. If the bank balance is constantly going down month in month out, then you should know that you've got a problem. So immediately by just looking at your bank balance it will tell you. Am I doing well, am I not doing so well? And that can be all tell from your bank statements. The key thing for me though is making sure they keep receipts. My gosh. Have I had conversations with clients on this one, you know, people are saying nowadays, I've moved over to Xero or QuickBooks. I could scan my receipts and just chuck my old receipts away and surely that should be okay? And like, Well, hold on HMRC can investigate you up to six years. Imagine that you move from Xero to QuickBooks or vice versa, or any other new system that comes on the marketplace. You've all of a sudden lost the electronic receipt that you had stored on that system and if HMRC wants to investigate, they're not going to take as an excuse of well I changed over to a different bookkeeping system so I can't provide you with those receipts, they're not going to accept that that as an excuse at all. So what I would always say is if you want to keep electronic copies, then do but also have a backup system in place, whether you want to store your receipts onto Dropbox or something like that. So at least you've got a two-way backup of all your receipts. I don't know it'd be interesting to know what you do John for your particular transactions because you're you're away from home. So how do you keep stuff together? John Wilson: Wow. Yeah, great question. It's in a variety different places. My accountant was actually trying to get me to move to Xero a while ago and I never actually did. Maybe I still should but yeah I end up with a bunch of paper stuff that comes to my my UK address and whenever I'm back in the UK, I can rationalise that and file it away and that stuff does does get kept you know, I make sure that anything paper is kept for for six years at least and and then the rest of the other stuff that ends up in my my email inbox, which that's another another kind of place where it kind of congregates as well: two places really. Simon Misiewicz: Yeah I think administration, it's always a bane of people's lives isn't it, you know. How do you... so many suppliers will send you an email with your bill on it. Some electricity suppliers are now saying, well, actually, you can get your bill online. So now you've got to get your URL type in username, password and then you download it, you put it in your Dropbox folder and how does that then correlates with all the invoices that you've kept it's it's it is a difficult one. I have to say, but it's one that each of us needs to identify that as a process and get comfortable with theirs, I don't fully believe that there's a one step process I could talk to you through that will suit everyone. I think it's really understanding what type of way do you like to communicate with? If it's email you may have a completely different approach to someone who is very much in love with paper for as an example. So, but one thing I would highlight to you is make sure you get your administration sorted and this is kind of what I would be saying to you is make sure you get invoices for your expenditure and that the invoice itself is a good description and I'm constantly coming across clients that will say to me, well, the builder wanted to give me a receipt on the back of a fag packet style book which basically said here's a bill for 30,000 pounds for refurbishment and can you pay into this bank account please and the issue I've got with that is anyone anyone could have produced that invoice. I could have produced that invoice and will HMRC say well that's acceptable? Most times out of 10 what HMRC is generally looking for is a detailed invoice, so for 30,000 pounds, you'd expect a bit more professional paperwork and what you're looking for is; Claire why I'm asking you to do this with your description is to make sure that your builder puts exactly what they're writing what they're doing in your property on the paperwork to support it. So if they are replacing a kitchen, replacing the bathroom, they put those very words on the invoice because the word replace or repair should tell HMRC that these costs are allowable for to put against your property income if you just said refurb and 30,000 pounds and HMRC have got every right challenge to say we believe that some of these items will be capital in nature and therefore we will take the full 30,000 pounds out and then you put that against your capital expenditure when you sell the property which doesn't do you any favours at all. And that's why I would say, having an invoice description of every single piece paperwork that you have from your builder is really important. John Wilson: Yeah, it's great advice. Actually yeah I yeah I'm sure we've all had invoices from from builders. I can remember a time when I didn't get any invoices all from from a builder; fortunately it was more than six years ago. But yeah, it's an important thing to remember. Simon Misiewicz: To be fair, we have it in our own building so Louise my wife and business partner got some refurbishment works on the on some flats that we own, as well as the commercial building that we're, you know, trading from and the builder that we're using did the exact same thing as I just described. Right. So you try to give us one piece of paper and said, I did some refurbs on this day this day this day. Here's my Labor Rate and some receipts for the materials so thinking there is how on earth have you just allowed this to happen when we don't even know which property it is and, you know, is it a repair is it replacement or is it capital in nature, because we do have some capital costs that are coming in here. So guys, I'm not here to be preaching to you. It's something that everyone has got to work on on a daily basis to get their invoices correct but we've always got to be mindful of can HMRC trip us up. If we can if we can be comfortable with that: the fact that we have paperwork in place, we can justify why we've allocated expenditure in our accounts to reduce our tax bill, then we should sleep at night. It's just when you get your builders that don't give you the information as you would require and and talking about the paperwork and getting things in place are lots of people will try and offset their car against their property business or trade business and in rent to rent, no different. Now the one thing I would always say is get yourself a mileage record of all the trips that you take so if you're traveling to estate agent or your joint venture or you're going to a property networking event or you're going to an education event as well. Then all of those journeys will be allowed for tax purposes to offset against your income and you can charge your company 45 pence per mile for the first 10,000 miles and 25 pence thereafter, so straight away if you did 10,000 miles in your car that's four and a half thousand pounds for the cost of into your business as an example. So it's a lot of money that you need to be thinking, well, how can I offset that against my business or just getting yourself a log that says on this date I travel from there back for to see this person or to see this event and a lot of people that we see will take their joint venture partners with them or their spouses or if they're in partnership together. Please do note down here that there's an extra five pence per passenger allowance as well. So if you've got two people in your car it is no longer just 45 pence per mile, it's actually 50 pence per mile, which means if you did 10,000 miles, that's quite a lot more to offset against your rental business. John Wilson: Very good. And if you have two passengers, then presumably an extra five pence again? Simon Misiewicz: Yeah I put this slide in because I just wanted to get your kind of gauging... Is this what you're doing yourself John, in terms of do you try and offset your your car cost against your property business? John Wilson: Not really. I mean, I don't do any mileage for my property business because because everything's everything's managed, so no that's that's not something I claim for at all. Simon Misiewicz: The one thing I would say on that, anyone listening in, you can get mileage trackers now so you can put it in your car and you press start stop and it will tell you how many miles you've done and it would then create your spreadsheet after the duration of time, let's say if it's a month or three months and you would take that mileage tracker and put it into your Xero or QuickBooks or whatever system using and it will automatically do your mileage for you. John Wilson: So is this an app for your phone? Simon Misiewicz: Yeah there's there's a couple of apps out there. So there's iClaimIt which is a great tool for expenses as well as mileage and I think Xero do their own as well as well as QuickBooks. Simon Misiewicz: Now you may recall me talking about getting builders to send you an invoice and the key three words I always think about when I go around a property is repair, replace, renew. These three words funnily enough came from HMRC. Who would have thought that HMRC would be a good marketeer? Using these kind of three "RE" words but they basically said, yep, if you replace, repair, renew any items in the property, then they will be fully expensed, provided that the property has got a buy to let mortgage on it. Now if you do rent to rent, it's a little bit trickier because you haven't got a buy to let mortgage. But ultimately, what you're doing is typically you're not doing much capital work, especially if you're doing rent to rent, you're not going to look to spend 20, 30, 40,000 pounds on capital expense to improve that property because ultimately, it's not yours so why would you do it? So in that regard, as long as you can go around the property and say, well, I've got these kitchens that I'm replacing straightaway. That should be telling you: Yes, I need an invoice from my builders saying these kitchens are replacement items and if he's been going around the property to renew your plaster work and your painting work then again he puts those very words on his invoice or her invoice and that's really important to make sure that they go around the property. Can I repair these items. These cupboards, wardrobes that are falling apart, the tiles: can I repair those, or do I need to renew that replace them. And if you do one of those items, then you can reduce your property income, and to be fair, you said where do I start. And to be honest, when I was an employer. I did not want a lot of property income as in profits. So what I used to do I purposely would find properties that needed about 15,000 pounds worth of refurbishment costs knowing full well that I would only make 300 pounds worth of profit, a month, not because I'm just after the capital appreciation. But to be honest, I want to keep my tax bill down so I will constantly buy one property every six months that needed a lot of love and care and I could do some refurbishment works on it, and it worked a treat, because I didn't pay tax on my property income for about eight years following this very strategy that I'll talking to you about now. Now some people may look to replace single glazed windows to double glazed, maybe not for rent to rent, but you may come across a property that if you're managing it a property and the rent is like say 400 pounds a month the you know full well then you could rent it out for 500 or something like that, then you may even want to look at the heating systems that you've got on there, especially if you're paying the bills. One thing I would say about anyone doing HMOs, rent to rent and that is your one of your biggest cost will be your utility costs and if you could get in your good insulation in the first place by changing some of the windows which sounds like it's going to be quite costly. But if you've got a long term game here, then you've got to look at it as a long term plan as well with that property, especially if you're doing a rent to rent and get an option in place as well so that person could sell that property from underneath you if you've got an option in place to buy it first so that's something else you might want to look at. What I would always say is items of whereby you're improving the insulation of your home's, don't look back and say, Well, now that might be too expensive because actually the long term gain of reducing your heating bills may be worth it. The key thing about all these items again. They are replacement items and therefore that can be offset against your property income so you get a kind of a win win so single glazed to double glazed most accountants will say that's an improvement. Yes, it is. But in tax law, it is allowed, because all it's doing is stopping the wind and the rain coming into your property. All the boilers and the fuse box is doing is producing heat and light so the fact that you've gone with a bit more of a modern fuse box. Actually it isn't an improvement cost because it's still providing the same function. So all those three items that you see in the diagram are allowed to be offset against your property income irrespective of what your accountant might say to you. So just some examples here. I just thought I put these together for you. So this is a an on the left hand side you can see there there's a 1970s kitchen which is typical when you're doing a rent to rent on an older couple and what you'll notice on the right hand side is that this is pretty much the same kind of lay out there but what you'll notice is new cupboards in there: same size, not much different. You could argue that it's not that much more modern, all it is is just taking the the latest thing from Magnet there and all of those costs will be 100% allowable to be offset against your property income because all you're doing is replacing existing 1970s wood chip kind of cupboards that you've got there and replacing it with bit more of a modern style of kitchen. So if that kitchen cost you 400 pounds to put in then that 400 pounds would be offset against your property income. However, this would not be allowed. So this is where I'm buying you're taking a property like on the left hand side still, but what you're doing now because you're using your rent to rent as a HMO, clearly you need a bigger kitchen, you're not going to get six people in the left hand kitchen. So what you might do is you might knock through another wall and take up the space, whereby it may be used as a dining room. So you might use now a kitchen diner to create more space now unfortunately because of that you're totally modernising the existing kitchen and therefore none of those costs would be allowable in fact would be capital and the problem with capital items is not offset against your property income, it's offset when you sell the property on. Now if you're doing rent to rent, you're not going to benefit from that because ultimately those capital costs will be only beneficial to the landlord that puts it in place. So unfortunately, if you are thinking about doing huge development costs what you have got to think about is if I've got capital costs nature building extensions not like most of you will do that. But in this example you've knocked though to another room or you've got en-sweets and you know in the property, then none of those costs will be allowed for you against your property income, nor will it be allowed to be offset against your capital expenditure either but so you do need to be careful with how much work that you do. Would you agree with that John Is that something that you've seen? John Wilson: These are kind of these are kind of new considerations to me. I've never done, personally, done, done any project like that. So it's new to me. But it's good to note and it kind of makes sense, you know, but I guess you know if you're doing a rent to rent and spend that kind of money on it, it had better be extremely profitable. Simon Misiewicz: Yeah, I have seen a lot of people doing rent to rent and they've probably paid too much money for the refurbishment John if I'm honest. And I've always said to clients: you're crazy, you're not going to get that money back if you're not you know if if the guy pulls it from underneath your feet and says thanks very much for doing up my property you know how much how tight is your contract with them to stop them from pulling the rug from under your feet? So you do need to be bit careful with what you do. But as I mentioned earlier. These items are not allowed as well. So as rent rent. if you're doing an extension not like you're likely to but now we do need to think about it, if you're putting in a new bedroom is, for instance, I do know someone who's doing this in Nottingham, interestingly enough they were doing rent to rent from someone who's been who's had a big four bedroom house and with their permission. They said, but I want to build this into a five, six bedroom house and I'll put it back to your four bedroom house after I'm done. And the guy said yeah, fine, do it because I didn't want the property hassle anyway. So so he created a six bedroom house now that's fantastic because that can generate more revenue, but the type of work he was doing, again, would've been capital in nature, because it is adding value to the property, for all intents and purposes and it's not replacing any items, not repairing, it's not renewing items. It's actually creating new and any new items for this perspective is always going to be capital in nature. So you can't unfortunately offset this against your property income. Now what I have done, for your listening in to me tonight I provided John with a tax pack so John can supply you with the allowable costs. What it tells you on that spreadsheet is basically trying to help you identify is it capital in nature, which can be allowed for rent rent or can I offset that against my property income so it tells you every type of property refurbishment that you're going to be doing in each of the rooms in that property and it will tell you this item can be offset against property income, this item needs to be capital in nature, but it also gives you VAT rate as well (I'm not sure if you can see that on this picture here), but you will notice that this number is certainly smaller than this number and that's because there's certain types of properties that you can reduce your VAT from 20% to 5% and if you want to know more details about that VAT reduction I talked about earlier, there's a link in that spreadsheet as well so it will tell you exactly how to help you reduce the refurbishment cost in particular the VAT that you'll pay on it.